There are many courses on Data Science that teach the latest logistic regression or deep learning methods, but what happens in practice? Data Scientist shares his main practical insights that are not taught in universities. Sometimes it is very easy to spot these kinds of transformations. For example, if you are doing handwritten character recognition, it is pretty clear that colors don’t matter as long as you have a background and a foreground. I know that textbooks often sell methods as being so powerful that you can just throw data against them and they will do the rest. Which is maybe also true from a theoretical viewpoint and an infinite source of data. But in reality, data and our time is finite, so finding informative features is absolutely essential. Now this is something you don’t want to say too loudly in the age of Big Data, but most data sets will perfectly fit into your main memory. And your methods will probably also not take too long to run on the data. But you will spend a lot of time extracting features from the raw data and running cross-validation to compare different feature extraction pipelines and parameters for your learning method. For model selection, you go through a large number of parameter combinations, evaluating the performance on identical copies of the data. The problem is all in the combinatorial explosion. Let’s say you have just two parameters, and it takes about a minute to train your model and get a performance estimate on the hold out data set (properly evaluated as explained above). 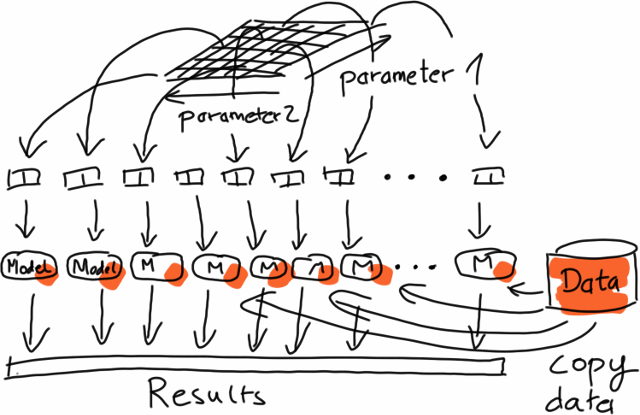 If you have five candidate values for each of the parameters, and you perform 5-fold cross-validation (splitting the data set into five parts and running the test five times, using a different part for testing in each iteration), this means that you will already do 125 runs to find out which method works well, and instead of one minute you wait about two hours. The good message here is that this is easily parallelizable, because the different runs are entirely independent of one another. The same holds for feature extraction where you usually apply the same operation (parsing, extraction, conversion, etc.) to each data set independently, leading to something which is called “embarrassingly parallel” (yes, that’s a technical term). The bad message here is mostly for the Big Data guys, because all of this means that there is seldom the need for scalable implementations of complex methods, but already running the same undistributed algorithm on data in memory in parallel would be very helpful in most cases. Of course, there exist applications like learning global models from terabytes of log data for ad optimization, or recommendation for million of users, but bread-and-butter use cases are often of the type described here. Finally, having lots of data by itself does not mean that you really need all the data, either. The questions is much more about the complexity of the underlying learning problem. If the problem can be solved by a simple model, you don’t need that much data to infer the parameters of your model. In that case, taking a random subset of the data might already help a lot. And as I said above, sometimes, the right feature representation can also help tremendously in bringing down the number of data points needed. In summary, knowing how to evaluate properly can help a lot to reduce the risk that the method won’t perform on future data. Getting the feature extraction right is maybe the most effective lever to pull to get good results, and finally, it doesn’t always to have Big Data, although distributed computation can help to bring down training times. I’m contemplating of putting together an ebook with articles like this one and some hands on stuff to get you started with data science. If you want to show your support, you can sign up here to get notified when the book is published. Mikio Braun is a Data Scientist and Machine Learning Researcher, currently holding a PostDoc position at the TU Berlin. He has always been interested in the whole range of tasks related to solving problems, from the math and theory down to actually building the whole thing and making it run. Although he worked on pretty theoretical stuff, as well as very practical stuff, he really likes to work on things which combine both, ideally concrete problems which contain some real technical challenges.